Marc Marquez increased his lead at the top of the MotoGP standings to 33 points with an impressive victory at the Australian Grand Prix. The Spanish Honda rider took the lead with six laps left before claiming his sixth win of the season to close in on the title with two races to go. Italy's Andrea Dovizioso is Marquez's closest rival but he could only finish in a disappointing 13th place. "I knew before the race that it was an important day," said Marquez, 24. "Dovy was struggling a little bit this weekend and I was feeling really good. In the race I was just waiting, waiting, waiting, waiting. "And then when there were seven, eight laps remaining, I just gave it everything. The fight was amazing." 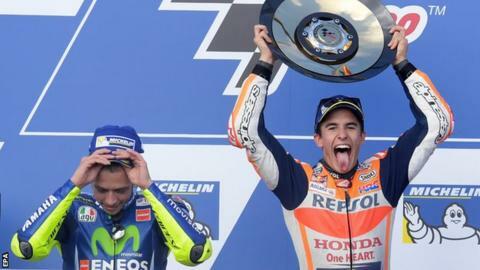 Italian Valentino Rossi - who returned to racing just three weeks after a double leg fracture last month - was second, while his Yamaha team-mate Maverick Vinales of Spain narrowly beat Frenchman Johann Zarco into third. Two Britons finished in the top 10 at Phillip Island - Honda rider Cal Crutchlow was fifth and KTM's Bradley Smith was 10th.